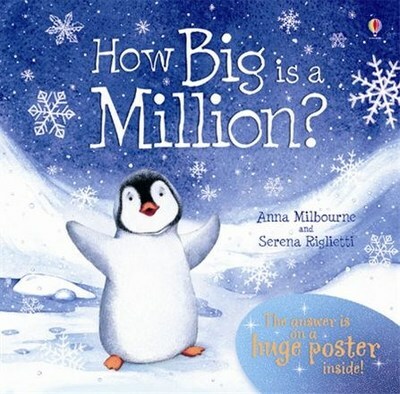 Anna Milbourne ​(UK) has authored over 60 picture books, including four of our favourite titles with mathematical connections, namely 'How Big is a Million?' (2007), 'How High is the Sky?' (2009), 'How Deep is the Sea?' (2009) and 'How Big Was a Dinosaur?' (2011), all of which are published by Usborne Publishing (UK). 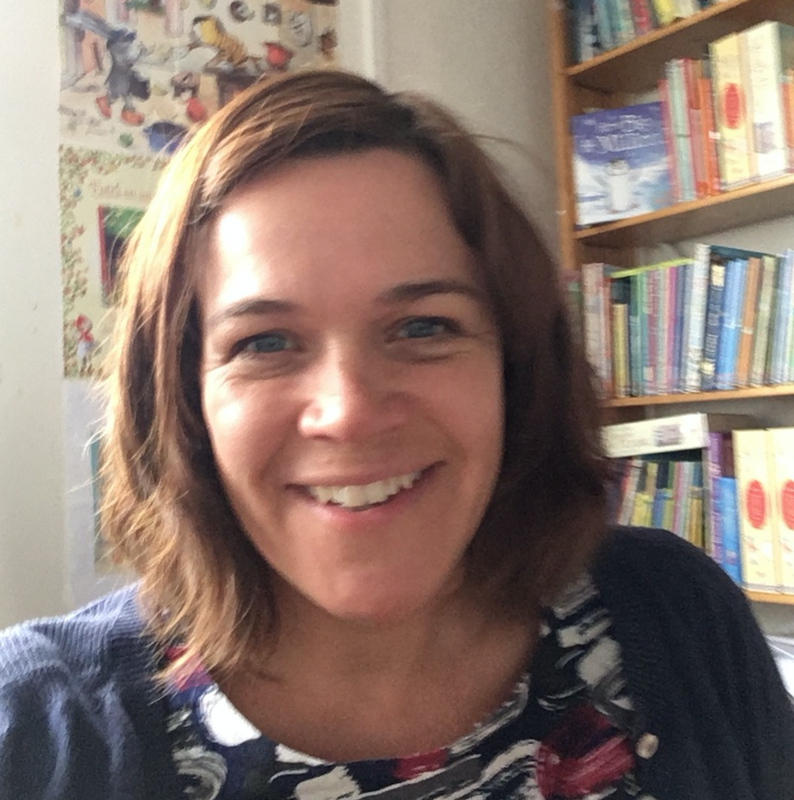 We hope you enjoy reading Anna sharing her experience of working on these incredible mathematical story projects with you! The ages of everyone in my family currently adds up to exactly 100 (which my maths-loving son noticed the other day, and won’t be true after he has his birthday). I always tended towards the arts – I loved stories and writing and drawing. I could do maths, but I wasn’t so fond of it. I remember that having to do mental arithmetic used to make me panic, and I found learning my times tables really excruciating. I think I saw it as being something I had to know by rote that didn’t really relate to the world or anything I felt fond of. I probably could have done with MathsThroughStories – I would have benefitted from making stories from maths or reading some! ​​You have authored over 60 picturebooks, including the four aforementioned mathematical stories that we love. What inspired you to write picturebooks with a mathematical focus for young children? ​I’m very happy you like them! I had written a series of picture books for Usborne Publishing, about things such as ‘On the Moon’ and ‘Under the sea’ which were all non-fiction, but told in a very narrative, storyish way to appeal to young children. The first mathematical picture book was ‘How Big is a Million?’ which came about in a brainstorming session at Usborne. We were looking at our counting books for younger children, and we’d shown how big 1-10 was, and a hundred, and even a thousand. And we suddenly wondered about calling a book ‘How Big is a Million?’ A million is a really hard number to imagine. Nobody really could. In fact, we weren’t even sure if we could show it in a book. So we had a designer print out a million dots on paper, to see how big it really was. That long ream of paper, covered in dots, was passed around, taken home to show our children and friends, and pored over so much that it became dog-eared and had sticky fingermarks all over. It became very apparent to us that the question was an intriguing one, and that seeing a million of something was evidently fascinating! ​It was decided that I’d be the best author to tackle it for the age group. And so I had a think about it. 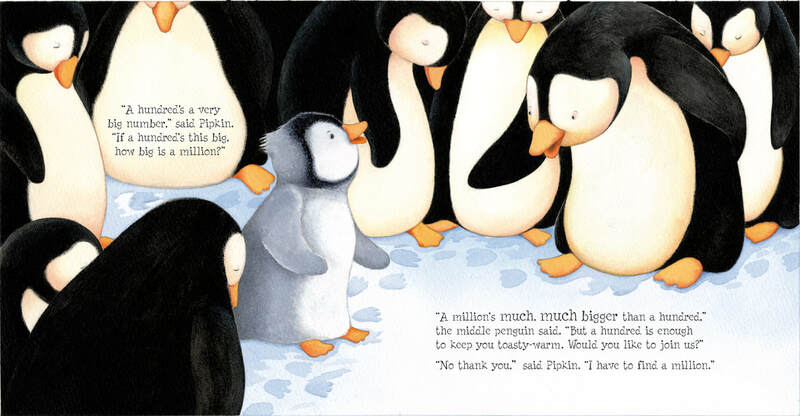 The other titles came off the back of the first, and of the character we created – a curious penguin called Pipkin who was always asking questions. We came up with those titles by thinking of other fascinating question titles with quantifiable answers. So with ‘How Big is a Million?’, we had the concept first – and the title. Then, I developed this character of Pipkin the penguin who was always asking questions, and wrote the story. I was trying to explore the question from a child’s point of view, so I was thinking you know how big ten is, and maybe a hundred, and a thousand is even bigger. And gradually you can get to a million, and through those numbers, understand how really amazingly big a million is … So then I tried to get my character to discover those things for himself, and he went on a journey – a real journey to discover them which was also a metaphorical journey of discovery, if you like. It was the real question explored through his world. ​Once I had unfolded the concept into a story and worked it all out, I worked with a designer, Laura Parker, to work out what we’d show in each picture. That made me refine the text some more. Then we worked with the illustrator, Serena Riglietti, first on character development (she sketched Pipkin and we gave her feedback and she and made him the adorable character he is! ), then on sketches for all the pages. We gave her feedback on the roughs, and she went to colour on them. The numbers build up – so there are ten fish, a hundred penguins, a thousand snowflakes, and then a million stars. The fish and penguins were illustrated, but the snowflakes were done on computer (with a few illustrated snowflakes) and the million stars were completely done on computer by the designer, Laura. This was kind of a separate process that we were working out with Production alongside the illustrations Serena was doing. The writing process for the other picture books was similar in structure – I worked on answering the question from the title in a quantifiable way, that related to the questioner and grew and grew. "The real challenge on ‘How Big is a Million?’ was how to show the million stars in the sky on the poster. And to make sure it was exactly a million, no more, no less. First we had to work out how big a poster we could have, which meant our Production department searching the world for a printer that could print the biggest piece of paper in a single go! Then we needed to create the stars and arrange them so they looked random, rather than just like rows of dots.​"
I love writing picture books with facts in them – because the world is a fascinating place! - and working with the designer and illustrator to pace the story right, and get across the sense of awe and discovery through the book. The real challenge on ‘How Big is a Million?’ was how to show the million stars in the sky on the poster. And to make sure it was exactly a million, no more, no less. First we had to work out how big a poster we could have, which meant our Production department searching the world for a printer that could print the biggest piece of paper in a single go! Then we needed to create the stars and arrange them so they looked random, rather than just like rows of dots. We worked out how many stars would be in a small area of the poster by dividing the space we had by the million. ​Then Laura, the designer, created a pattern that she could repeat on the computer. The information was too much for the computer to handle and it actually crashed and stopped working. She had to move all the files onto our biggest computer, and make the star poster there. It took so much work! An even bigger challenge for me was making sure there were exactly one million stars on that page, no more and no less. We did this by having one repeated pattern of stars, which I counted carefully several times, which was then rotated and repeated to make the whole poster. By fixing the repeats and checking no stars were lost or covered around the edges, I could ensure there were a million of them exactly by the end. I know that we got it right, which pleases me immensely! But the most satisfying thing, I think, was a review from a reader I have never met telling me of her children’s gasps of amazement when they saw the million. And when I took it into my own children’s school and read the book, the gasps about the poster at the end were lovely to hear too!! ​Did you find coming up with a storyline / context to embed your chosen mathematical concept in difficult? Where did you draw inspirations from? I think we came up with an original cover idea with a penguin and lots of snowflakes, to get across the idea of big numbers. That was the germ of the idea, but I wanted this penguin to be asking the question, and that led me to who he would be, which led me into his world and his determination to find the answer to his question. 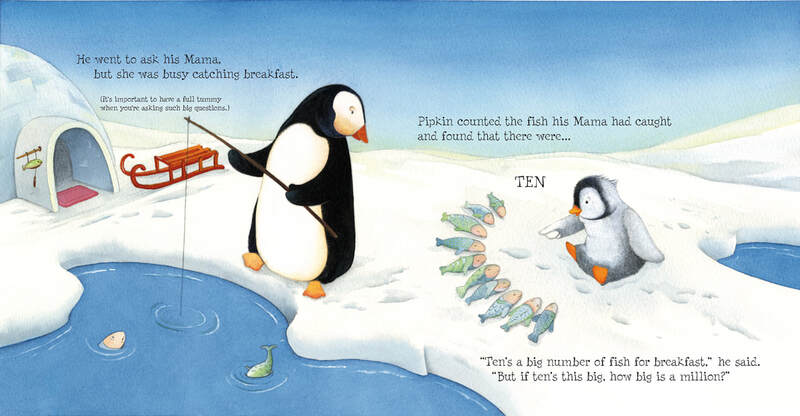 I was trying to explore the concept of a million along with the character, and show ten, then a hundred, then a thousand and then the million, so that I was sure the reader would ‘get’ how big it was and share Pipkin’s wonder and awe (and ours!). I was thinking of all our wonder when we saw the printout of a million dots, and it reminded me of the feeling I get when I look at the stars in the night sky. That “WOW the world’s so big and I’m so small” feeling. I thought I could combine them and make that the million that Pipkin finds at the end of the book. So I took Pipkin on a journey that showed him bigger and bigger numbers until he finally got there. I thought it was most important to begin with the question, or concept. I always start a book by imagining my reader and the question at hand – how big is a million? or how high is the sky? and so on. And I think about approaching the question from their standpoint. Although my character was a penguin, living in an igloo, he is very much like a curious child, and has all the real qualities a child needs to learn – curiosity, an adventurous spirit, determination, but also the ability to accept help along the way. In that way I hoped my reader could identify with him (perhaps more than if he were a particular child who looked nothing like them!). ​On average, how long did it take you to work on each of your mathematical picturebooks? From initial idea to the book coming into the office was about a year. I think writing and illustration was about six months, in all, and production another six months. But I didn’t work solidly on this one book all that time. I probably wrote a first draft over about four days and then left it for a day or two and came back to it, altered it a bit and showed it to people, and thought about it, and changed it again, and so on, over the next few weeks. The illustrations took about four months – and I was constantly tweaking the text through that time to work properly together with them. It took a further six months for thousands of copies of the book to be finally printed and sent (by ship!) to the UK. During that time, I checked ‘proofs’ – printouts of the pages from the printer – to make sure everything was correct, and the pictures looked good printed, and the numbers showed correctly and so on. We had to ensure all the things were countable, should anyone wish to count them. And also we had to be 100% certain that if we were saying there was 1,000 snowflakes on the page, there really were. It had to be right. So there had to be no ambiguity even while we were showing a group of huddled penguins, or a thousand snowflakes – they all had to be clear and, of course, the number had to be correct. I must have counted everything a million times, I think, during the course of the book! I’m aware of the need to be fair and equal in representing characters in books. Pipkin happens to be a boy. I had thought about making the main character a girl, but I also wanted to have a warm, safe mother figure in, to make it feel cosy and safe for the penguin to be so curious and explorative, and I didn’t want it to be all female, so the main character became a boy. In ‘How Big was a Dinosaur?’, I made the Tyrannosaurus Rex a female, for balance – everyone assumes they are male, but I think the females were just as scary! And in ‘Where do baby animals come from?’ [non-mathematical], Pipkin gets a baby sister. I think she will be as tenacious an explorer of the world as Pipkin is, so could provide a good female lead. I think it helped me that my characters were animals – readers of the opposite gender aren’t as likely to feel put off as they would if it was a human! We didn’t have a word limit per page for these books, but we had a feeling of the ‘right’ amount of text per page – it was only a couple of lines per page. And the pace had to be right to tell the story, and to allow the reader to follow the gradual mathematical understanding as it build up. It was important for the concepts not to go along too quickly. I constantly ask myself if everything is understandable for the child – from concept onward. It doesn’t only inform the language; it informs the entire structure and perspective of the book. But it was important to me that these books were charming and nice to read, and very simple. And also too much text can look daunting, which I wanted to avoid. I was looking out constantly for ways in which you can explain or show things through the image without explaining with text. I don’t currently have any planned but am open to suggestion! I’d love to write something with Pipkin and his sister – perhaps something to do with odd and even numbers and sharing. Eric Carle with ‘The Very Hungry Caterpillar’ has to be a clear favourite of mine – the holes were so good that you put your fingers into while you’re counting! I love the simplicity too of the story. I love ‘Cockatoos’, a picture book about counting down from ten by Quentin Blake because it makes me laugh. It doesn’t seem like a book about counting, but it is! "My husband, who is a mathematician, explained to me about logarithms, and how I could use a logarithmic representation instead. That was above my level of understanding at first, and took a lot of work, but it went into a book for preschoolers. It made it have a solid backbone. Sometimes you have to understand way more than you actually explain, in order to make a good book based on facts." I routinely have to explain things to young children and I find it enriching as an adult. For example, I realised that the poster for ‘How High is the Sky?’ which shows how high everything is (birds, planes, comets, satellites…) from the ground to the Moon (and stars beyond), couldn’t just represent the real measurements all scaled down, or when we came to illustrating all the things like birds, planes, hot air balloons, from the story, they’d have to be really squashed at the bottom, and then we’d have lots and lots of empty space, which wouldn’t look that good on a poster. But I wanted it to be representative, with a scale that made mathematical sense down the side. My husband, who is a mathematician, explained to me about logarithms, and how I could use a logarithmic representation instead. That was above my level of understanding at first, and took a lot of work, but it went into a book for preschoolers. It made it have a solid backbone. Sometimes you have to understand way more than you actually explain, in order to make a good book based on facts. With a picture book, you have a triple chance to engage the interest of a child – the maths itself, the story and the pictures. Also, exploring mathematical concepts through stories also takes the maths away from being abstract and puts it into a context, so enables true understanding, rather than just understanding in an abstract way. Ultimately, maths is taught to be used in real situations so this helps make it real, or show the connection with the real world. I know of a scheme in primary schools where children who have understood mathematical concepts in their class, are asked to act as ‘explainers’ to other children in their class. I think this is great, because to explain something you have to understand it yourself very thoroughly, so it helps both sides. I have found this in my job too. When I have to explain things in a book – especially to a child - I have to really understand it myself. It makes you realize which parts you have taken for granted and which parts you really understand. I think it’s a good idea to fix on the mathematical concept first, and be able to identify what you want to explain. So maybe it’s counting to ten, or fractions up to quarters, or taking away in numbers up to twenty, or the three times table. Then you need to think who will be reading the book, and how you want to explain the maths concept. Then you can write the story based on that content. Then break it down into what goes onto each page (and work out how many pages it needs). After that they can think of how to illustrate the pages and arrange the text and pictures on them. Before sending things to publishers, research which publishers publish the kind of book you are offering. Often publishers have a format for how many pages they have in their picture books, and so on. Usually offering a précis and sample pages is enough, unless the book is very short. Sometimes it’s good to find an agent, instead of offering directly to the publisher. Some publishers don’t take unsolicited manuscripts, and an agent can also work on helping to make the idea more attractive to particular publishers if they think it’s a good one. "The MathsThroughStories.org website is amazing - a fantastic resource. [...] I will certainly use the recommended books for research and also with my own children." ​​Illustrations by Serena Riglietti from How Big is a Million? 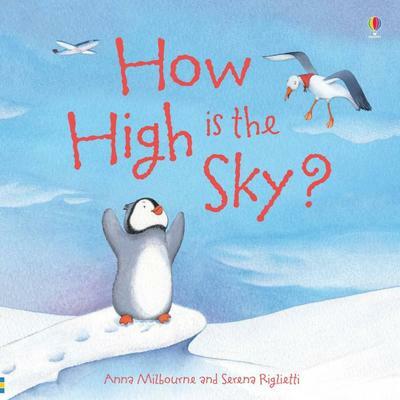 by Anna Milbourne - copyright © (2007) by Usborne Publishing Ltd. All Rights Reserved. 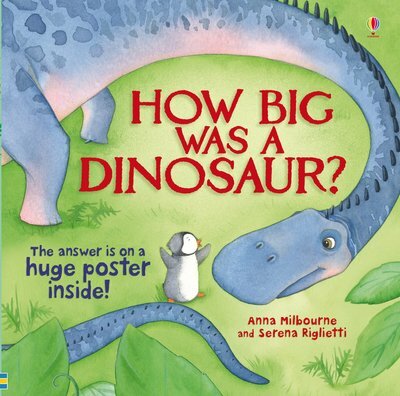 ​​Illustrations by Serena Riglietti from How Big was a Dinosaur? 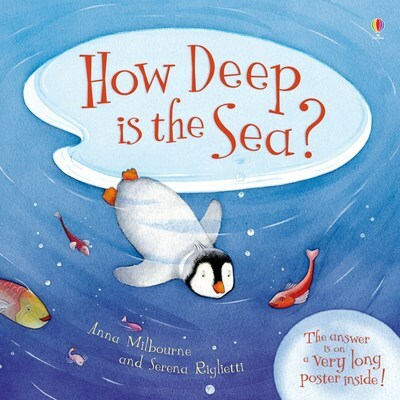 by Anna Milbourne - copyright © (2011) by Usborne Publishing Ltd. All Rights Reserved. Have comments about this interview or Anna's books?